Tarmac Sportz are very pleased to have this incredibly shiny collection of exhaust systems to showcase to you. They come from our friends at Invidia, veterans of the aftermarket car parts industry and well-known for quality and reliability. Invidia started production on racing exhausts in 1998, specialising in exhaust systems that could cope with harsh racing conditions. Invidia use Grade 304 stainless steel (with the exception of their titanium systems), this grade is chosen for strength and durability. Tarmac Sportz have been supplying Invidia for many years and highly recommend them. These petrol heads began manufacturing exhausts back in the late 80s, for racing cars only, but they soon had requests to expand into the general public market and let ordinary people get more from their cars. They’ve constantly strived to innovate and improve their designs and methods to remain in front of the competition. Invidia understand and appreciate those of us who just can’t get enough of that roaring engine sound, that’s probably why we at Tarmac Sportz get on so well with them. Take their N1 range, for instance, this collection of noisemakers are all constructed from the highest grade polished rust-free SUS304 stainless steel. They provide the maximum airflow and horsepower increase, all whilst letting the engine roar just like it’s always wanted to. You get more power when you need it and more noise to really bring a smile to your face as you push your car to the limit. The Invidia Gemini range is for those who care less about noise and just want performance. Advantex technology lets the muffler reduce the sound even more, but without sacrificing airflow and performance. The Gemini system is constructed using all the latest methods and out of tough materials to ensure its long life time. 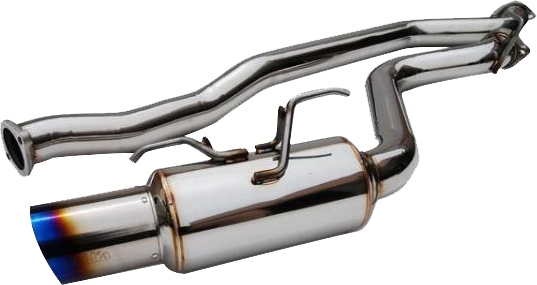 They also offer cat-back exhausts systems - these are installed behind the catalytic converter and are designed to make your car louder and faster where it counts. They don’t only have entire exhaust systems in their range. If you’re only replacing a part of it they’ve still got you very much covered. The tips come in a variety of finishes, if you want that burnt look to add a bit of an edge to your vehicle. Invidia use the latest in industry methods and innovations in the construction of their range of exhausts and pipes. Only using the highest quality materials, like SUS304 stainless steel and titanium, Invidia are committed to parts that will serve you faithfully, year after year. They always make use of the mandrel method of bending when making their pipes - inserting a rod into the pipe when bending it to ensure no compromise of physical integrity - because reliability and safety are paramount. In their workshops you’ll find robotic welding machines ensuring that every single weld is strong, uniform and precise. CNC machining means that parts fit together perfectly, to massively reduce the chance of wear and faults. The team at Invidia conduct research and development when designing their exhaust systems to ensure performance, great sound quality and, above all, excellent construction.